A constituent speaks in front of seated District 2 candidates Wesley Faulkner (left) and Casey Ramos (right), as well as incumbent Council Member Delia Garza (middle). 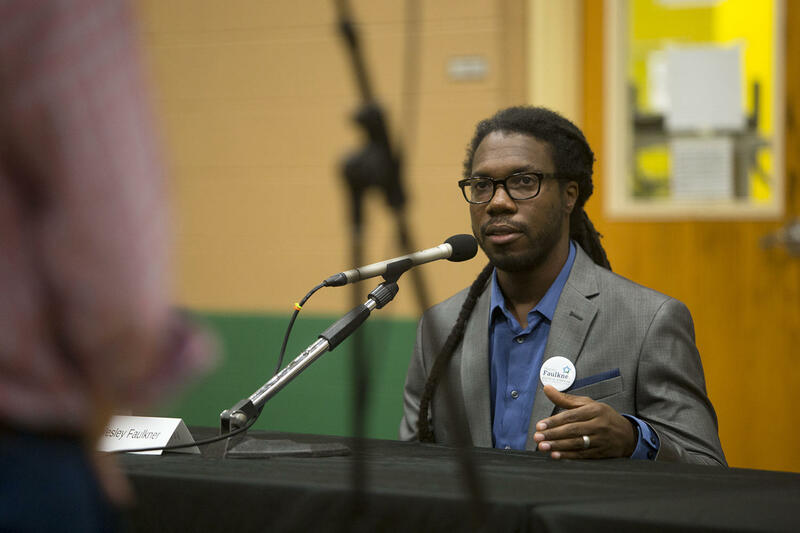 Beneath a basketball net and a shut-off scoreboard at the Dove Springs Recreation Center, two city council candidates for Austin’s District 2 squared off with each other and the incumbent, current Council Member Delia Garza at a forum hosted by KUT, the Austin Monitor and Glasshouse Policy. The forum kicked off with a question about the transportation bond voted onto the November ballot by council members last month. The question was whether the candidates support the $720 million bond. All (including Garza, who abstained on the dais) said no. Candidate Wesley Faulkner, who currently works in social media, echoed Garza’s comments on the dais in August, when she said the bond had been moved through council in such little time. “The way it was railroaded through and pushed through really quickly, I don’t think on balance it’s a good plan,” said Faulkner, as kids chased one another behind a mesh separator cordoning off part of the basketball court. 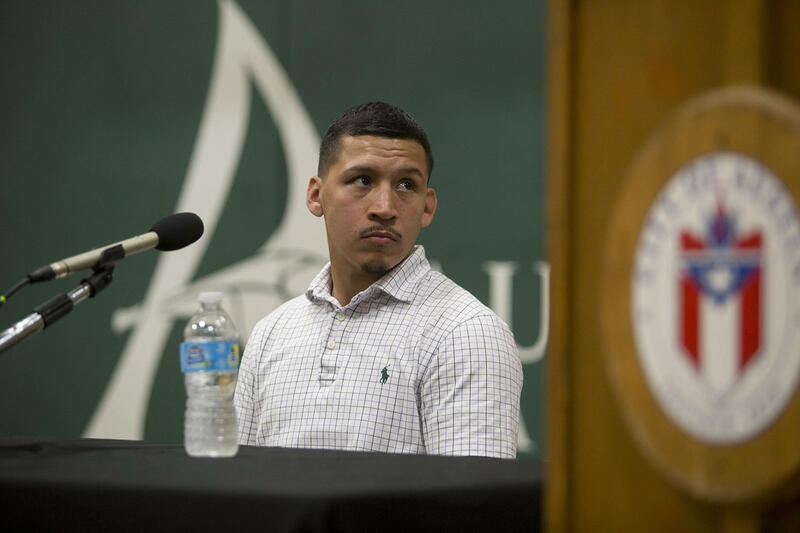 Candidate, professional boxer and current college student Casey Ramos agreed, saying that there were little improvements for District 2 in the bond on the ballot. But when asked what they felt was District 2’s biggest challenge, candidates diverged. Faulkner emphasized incentivizing more knowledge-based businesses to set up in the district. “People don’t know about [District 2]," he said. "People don’t come here unless they’re going to the airport." Ramos stressed containing local development. “If we don’t control the unbridled development, then we won’t be able to enjoy these [other] resources,” he said. 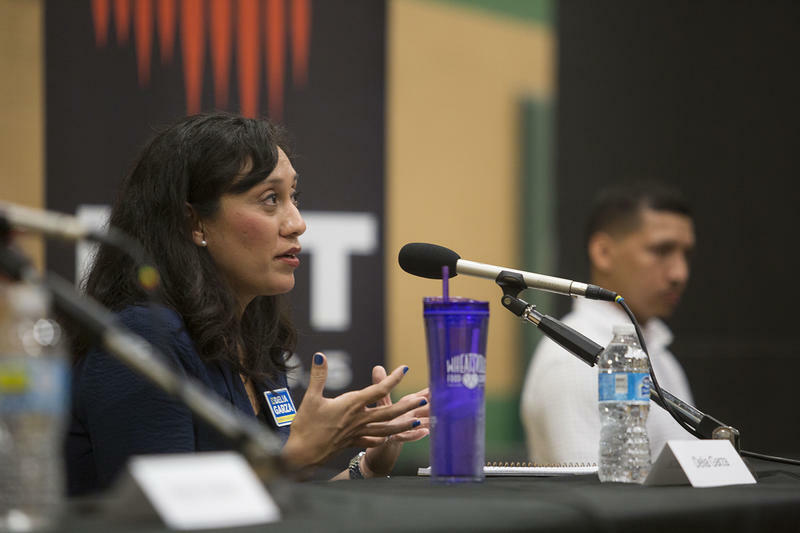 Garza stressed affordability of which, she said, transportation is one piece, with many residents, “having to own two cars because we don’t have a reliable transportation issue.” District 2 is one of the lowest-income districts, with a median family income of $42,650. But during her response she also took time to knock at Ramos’ inexperience, suggesting that he did not understand the city’s budget. Candidates and incumbent also said their piece on police body cameras, how to maintain Austin’s creative community and healthcare.